You know and love @MrKal_El on Twitter, now know and love him here as he gives us his opinion on how Palm and HP need to make a splash, and soon. Recently I’ve been engaged in a bit of a debate (on Twitter, naturally) regarding Palm and HP at CES 2011 and potential for the reveal of the much-rumored PalmPad. If you were to ask me, I’d say that January of next year is too late to reveal the PalmPad in what is fast becoming a crowded tablet market. So I’m going to take a moment to expand a bit on what I feel would be a agressive (but possible) release schedule for webOS hardware and software to succeed in the current market. First, of course: HP and Palm need to release second-generation smartphone hardware as soon as humanly possible. Palm has been all but forgotten in the public's eyes. Even many current webOS users (especially those from Sprint launch day - June of last year) are admitting to me it's getting harder to hold onto their Pre/Pixi with newer and better hardware from different makers coming at all angles. New hardware does wonders for getting back consumer and industry support (see: Motorola). So, here’s my plan: Palm should hold an event in October. To be shown: a new expensive ad campaign, second-generation smartphone(s), webOS 2.0, and renewed and expanded developer support. HP needs to talk about what resources they are investing into Palm and explain why they wanted/needed Palm to expand into the emerging mobile market. 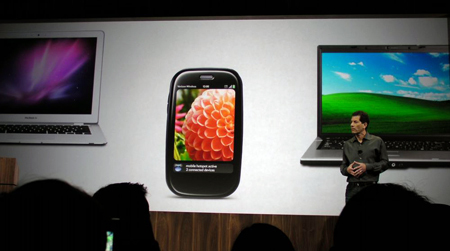 During this event (it ought be an event, just a presentation’s not quite enough) is when Palm should unveil the PalmPad. The BlackBerry PlayBook, Samsung Galaxy Tab, multiple tablets from Dell and Archos, and the Windows 7-running HP Slate have all been shown off, all with similar release dates of Q1 2011 like the supposed PalmPad. There are plenty more tablets on the way, including the beastly Motorola Stingray, as well as a presumed Apple iPad 2. So yeah, they need to show their bad boy off. Everyone else has. Usually we say that crowing that “everybody else is doing it” isn’t a good motivator, but in this case Palm’s risking getting swallowed by a fast-rising tablet tide. All this being said about the tablet, I’d like to take it back to the smartphones. These new devices need to be out before the holiday shopping season officially kicks off with Black Friday in November. Get it into the hands of customers, pronto. Of course, this poses the problem of what to do at CES. Palm has unveiled new devices two years running at CES, and the media and Palm fans alike expect the same. By January 2011, Palm and HP will have been hitched up for nearly half a year, and while we do acknowledge that hardware development takes some time, HP’s considerable bucks should greatly accelerate whatever Palm had in development. CES is where the flood of second generation smartphone hardware should commence. Options: bigger screens, a model with a landscape keyboard, keyboard-less phones, a high-end “candy bar” (e.g. Pixi) style device, and so forth. Unlike with the release of the Pre (and to a lesser extent the Pre Plus and Pixi Plus), these new devices should be available soon after reveal. Weeks, not months. And back to the PalmPad: release should be about this time as well. Beat all the other “Q1 2011” devices to market with a January launch. And if you’re jonesing for a one-more thing, try going the iPod Touch route and introducing a phone-less webOS handheld. Todd Bradley thinks that webOS is number two in 3D gaming; while the iOS ecosystem will be next to impossible to dethrone, Palm could solidify its position as #2 and shrink the gap by releasing a device that young gamers could use without their parents having to opt for the contract that a phone requires these days. Oh, and it’d make for an easy developer “phone,” instead of Palm having to offer options for slightly-cheaper phone-enabled devices. And one more one more thing: webOS 2.1 (or 2.2 or 2.5 or whatever). Make a splash with all sorts of fancy new features, including the device-to-device interconnectivity that would be needed to make things like the vaunted webOS printer possible. That’s a lot for CES, so some time should be allowed for the hubbub to die down before hitting the world with the first annual Palm webOS Developer Conference (PWDC, if you will) announcement. Scheduled sometime in the early summer (May-July), it’d be time to unveil the third-generation “superphone” models, with webOS 3.0. By this time it’d be nearly a year of Palm and HP, so the fruits of these labors should be evident. Beats Audio, Voodoo DNA (trot out Rahul Sood), and other HP magic should all be present and accounted for. Also, the true build-out of the Touchstone brand should come to fruition, with multiple models and additional connectivity built in. With webOS 3.0 the operating system finally takes that leap that HP’s been dreaming about: printers, televisions, toasters - you name it, webOS can run on it. With such a diverse array of devices, it may be time to spilt webOS into two product categories: webOS Mobile (tablets, smartphones, etc) and webOS Home (for stationary devices like the printer and television). Of course, you’re then running the risk of going all Microsoft and confusing customers, so keep it simple. While this is the developer conference, HP knows that a large portion of their sales are to the enterprise market. It could bore the developers, but it’ll excite the IT professionals: webOS Enterprise, with corporate-bound hardware and services. The potential trouble with running different lines of hardware and software is that release schedules could fall out-of-sync. But with the resources of HP, hopefully that would not be a huge problem. If anybody can do it, it’s Palm and HP. The competition is not slowing down one bit, and HP and Palm have their work cut out for them to get back in the hearts and minds of consumers and the press. The capital and talent are there, they just need to use it. Agree, disagree? Sound off in the comments!